In this fourth Ice Age story, mammoth Manny and his friends Sid and Diego head off on another adventure after their continent is set adrift. Aboard an iceberg as a ship, the friends meet new creatures and tackle pirates as they encounter a new world. ICE AGE 4: CONTINENTAL DRIFT © 2012 Twentieth Century Fox Film Corporation. All Rights Reserved. It’s important for language teachers to have a wide variety of authentic graded Readers from Scholastic Shop in the classroom. I have used chapters from Popcorn ELT Primary Reader Starter Ice Age 4: Continental Drift as a Pilot English Olympiad for the 3rd and 4th formers (9-10 y.o.). Their task was to read three chapters and then complete the exercises that were offered at www.popcorneltreaders.com in the Teacher’s Notes section. Twenty-nine participants with the mixed proficiency language level enjoyed reading the book a lot! They kept on asking me if I had some more illustrated readers of this kind. By analyzing the results, I may conclude that this book should be at the Starter Level, not at Level 1. All the participants read three chapters in 15 minutes and completed all the tasks. 5 students answered all the questions correctly, not just a single mistake! So, this means that these texts were not challenging for them and they might use this Reader for the extensive reading as a step forward to more serious literature. This Reader can be a valuable asset when speaking about good and bad characters, moral/family values, the feelings of empathy and sympathy. Though our students at this level understand present perfect, past simple tenses, and here we can only observe some elementary grammatical phenomena: present simple, present continuous, prepositions, can/can’t, imperatives (let’s), negative imperatives, phrasal verbs. I would include some difficult grammar points for students to train ‘noticing’ strategies as well as keep the higher level students on-task. Besides, I would add some critical thinking questions, not just the vocabulary tasks. Next year I will be using this book with my younger students (10-12 y.o.) when introducing the history and geography of an Ice Age (as a CLIL component). Though a lot of teacher’s work should be put upfront: introducing the definitions of Continents, Continental Drift, Ice Age. But great illustrations in the book will greatly scaffold the reading process! Ice Age 4 reader is definately an eye catching book. It was aimed to be used with my junior student’s at first place, but as soon as my son saw it he wouldn’t let it off his hands.He is seven years old and his curiosity in English is great, so this book was a great way to get him into reading and learning new words in an indirect way. The Real World part took our reading into a next level and, personally, I find this part the most intriguing. My junior students , who are more familiarized than my son, found it an easy read, even the weaker ones, but they definately had something to learn as well. I think readers like this, graded wisely, leave the student with the sense of fullfillment and accomplishment, as well, and this is extremely useful in order to create future readers. I will definatelly try more readers of the same line, they surely worth it. This colourful book is both relevant and appealing to younger EAL learners who are familiar with the characters. The sentences are short and clear and the picture stills from the film make it easier for learners to follow the story. Illustrated “new words” at the beginning of the book prepare learners for the story and the follow-up activities are fun, particularly the scene acting. Although it is designed for younger learners, I think some teenagers will also enjoy this book – I can certainly imaging being able to use it with them in class. I have read Ice Age 4: Continental Drift with my young students in mind. Children aged 8-10 would enjoy the bright illustration while the simple language, big and clear font would help them engage with the story in a non-threatening way. 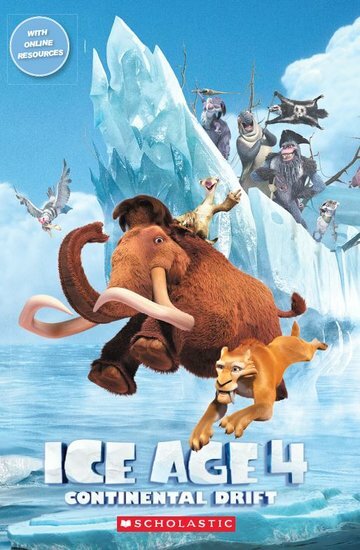 Young readers (EFL students) are usually in awe of reading books, so Ice Age 4 would provide a great, safe start to this. The picture dictionary at the beginning of the book is particularly helpful, while the post-reading activities are fun and a lovely way to round it all up. I’m sure children worldwide would be delighted to read it! This book is a great ELT reader for pre-A1 level Young Learners, who are learning to read English.I have used it with different groups of 6-year-olds both reading it out to them comfortably lying on a mat in our library and projecting a scanned chapter on the IWB in the classroom.The range of vocabulary & grammar structures is suitable for primary students.The plot is easy to follow and clearly supported by engaging visuals from the actual film.Before using the book in class, I have used a couple of official trailer videos to introduce some keywords e.g. crack, continent, drift, which helped set the context and explain the title.I teach in Italy, where foreign films and characters are often translated or adapted for Italian speakers. For younger students, I recommend the picture dictionary provided in the ‘New Words’ section in the front, which offers an opportunity to both pre-teach keywords before you/learners read and essential consolidation work at the end of the lesson.Classroom work was easily done: the ‘After you read’ activities at the back are well thought-out and engaging.Plus, they are multi-level: you have word puzzles and a song for 6 or 7-year-olds and sentence re-ordering & matching tasks for older kids.There’s plenty you can do with the text and the illustrations from the book: line cut-outs for acting out, a scan of the pictures from each chapter shown on the IWB in random order for re-ordering activities and pelmanism with the vocab/picture cards from the New Words section.Finally, I found the ‘Real world’ sections with History and Geography content really useful to teach these subjects through English. All in all, a fun and engaging book that will give teachers plenty of material to work on and great learning opportunities for Young Learners of English. I’m an ESL teacher in France and I gave this book to ony of my 11-year-old students. She started learning English 6 months ago. She said it was easy to read and understand thanks to the pictures and the vocabulary pages at the beginning. The level of language used in the book is also perfectly suited to beginners. She was so proud to have read a whole book in English! She enjoyed finding out about the continents in the “Real World” pages after reading, even though they are slightly harder to understand. I think they make great material to use in class as part of a cross-curricular project (English and geology or geography). The games are fun and the role-play and song are excellent material to practise speaking skills with your students after they’ve read the book. I must say, as a teacher, the free resources provided on the website and the after-reading questions mean you can easily test the children’s understanding of the story – saving you precious prep time! The reason I’m giving this book 4 stars only is because we both thought the story is a bit over-simplified compared to the movie, so if you have older pupils (9, 10 or 11) they might find it a little frustrating. No doubt younger children will love the book though. This is a fantastic book if your young students have seen or are familiar with the film. The illustrations come from stills from the film so while it is clearly appealing it makes it difficult at times to fully follow the events and where all the characters are located in relation to one another. For example, the first chapter is entitled ‘a big crack’, however, the crack in the ice is not actually illustrated. However, if your students are familiar with the plot this won’t be a problem. There are also two pages dedicated to new words, one of which is ‘crack’ which should clear any confusion. I especially like the photocopiable material at the end. I think the information about continents is interesting and useful for young learners to make the connection between the story and the history of our planet. Young learners will also enjoy asking each other about their favourite character. Great fun for the students! The Ice Age 4 Continental Drift can be used with children who can read as well as with those who cannot read. I have used it with both groups and we had a great time! Almost all of my students had seen the film, so they were familiar with the characters and they remembered the plot. The pictures in the book are really nice and colourful, children were looking at them with interest. I found the teacher’s notes available on the website very useful, especially the flashcards with new vocabulary. The “Who says this?” exercise was great fun to do, I wish it was longer. I omitted the two pages with the continents, as I find them too abstract for my pre-school students. The book can also be a perfect and affordable end-of-schoolyear present for the students or an award in a competition. Popcorn ELT Readers are a great series for young learners of English. Not only because of the low-level, which makes it possible for kids to start reading on their own but mainly because of the titles it offers. Ice Age 4 Continental Drift is just a perfect example of what kind of stories can motivate and engage children in EFL lessons. When my 8 and 9-year-old students saw the cover of the book, they started jumping and clapping their hands with glee! They had already seen the film and liked it a lot so they were excited and eager to listen to this story in English. After teaching new words from the picture dictionary, I read the story and showed my students the pictures from the film. They had never been so quiet in the classroom! Then, they were delighted to do some activities from the Photocopiable section. During our next lesson we learnt more about continents and used Real World pages included in the book. There are more ideas on how to use this graded reader in Teacher’s Notes which can be downloaded from the Scholastic website. I highly recommend Ice Age 4 to all teachers of English. This ELT reader is beautifully presented, interspersing the text with stills from the film. Whilst this makes the text very engaging, it also means it’s a little difficult at times for younger learners (5/6-year-olds) to fully grasp the story as the backdrop is incredibly similar throughout! However, they were familiar with the characters and some had seen this film, so were interested in the story. The text is easy to read but I would recommend having a few copies if working with a group of learners as you could then more easily ensure everyone is following. I used the story with three small groups of about eight Spanish 5- or 6-year-olds and they were keen to read – having just one copy of the book meant that others couldn’t always see easily when one person was reading. Thinking about follow-up tasks both during and after reading, they coped well with the chapter quizzes (available in the very extensive teachers’ notes) when we worked through them as a class, but I felt most of the tasks in the book would be too challenging for these learners without significant support. For students beginning to read independently in English the reader of Ice Age 4 – Continental Drift is a fun and nice way to start. This reader is based on a popular film which is well known by a lot of young children. The reader is written with simple basic words. The sentences are short and easy to read. The chapters have good titles with which you can easily make a word web to start off in class. Each chapter gives you the opportunity to practice different skills; reading, listening, speaking and writing. By using the real world information, the students can get acquainted with the seven continents which makes them more aware of what the word means. The full colour pictures in the reader make it nice to read. It gives an extra boost to the reader. Acting out the scene in class could definitely be fun. I would round off with the chant every lesson. It would be a nice ending of the lesson. This reader is good value for its money because it has every element you need as a teacher to have a good lesson in which you can practise all the different skills. The focus is still reading but this combination gives the reader something extra. I enjoyed the well explained and engaging tone to this historic subject, for young children at pre-A1 level. The introductory new words with pictures, story, real world and then interactive games and puzzles, and a song listen to, allowing the information to flow comprehensibly and well. The book can be read individually, in groups or by the class as a whole. The cartoonlike figures are engaging to all children and their imagination, at different levels, and make it age elastic . It is a dynamic book, a delight to read. This book is beautifully presented and ideal for EAL learners. I especially like the non-fiction link as there is a lot of research that stresses the importance of fiction and non-fiction being read in tandem and the benefits that that has. The new vocabulary page is also excellent and would defiantly be something that I use as a pre-reading activity with my students. The only negative that I can find is that it would be nice if it was a little longer so that a student could feel like they are reading a full-length book (obviously it wouldn’t need to be the actual length of a full book!) Overall the visual elements and the engaging topic make this a resource that is well worth the money!